You know the look on Wally’s face after he learns that Barry is the Flash? I made the same one when everything went down in this episode’s tense closing minutes. Although season two has had its issues, these last few episodes have been amazing. 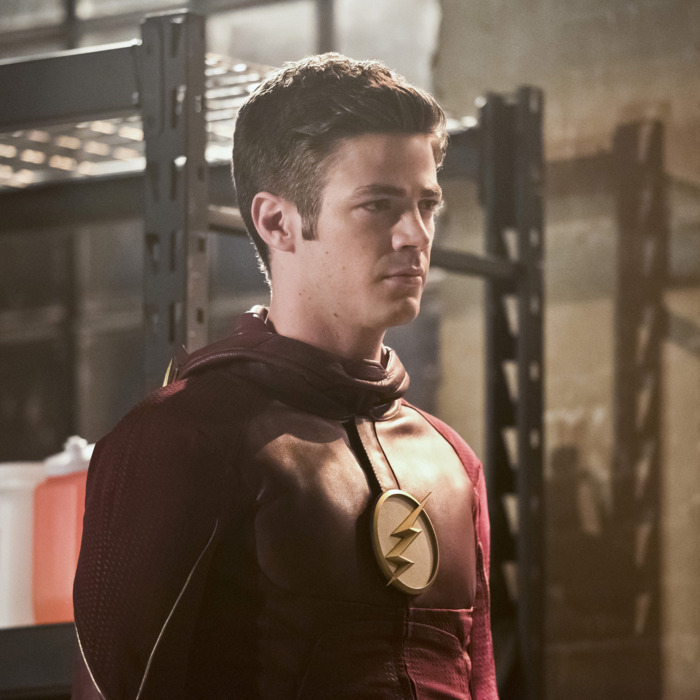 How will The Flash resolve everything in next week’s finale? There’s still so much story left to tell. “Invincible” is a near-perfect episode, hindered only by a few hiccups. (How did Zolomon open his own portal? And yikes, when Barry saves Dr. McGee, the limits of the CW’s effects budget are really obvious.) Those issues are easy to brush off, however, because the rest works so well. The episode opens with Central City in utter chaos. While the metahumans from Earth-2 wreck havoc, Barry must put out their literal and metaphorical fires. But he’s not afraid — instead, he’s overconfident. The speedforce has changed Barry. He’s happy and joyous and unafraid. But as Iris says to him, “A little fear can be a good thing, It helps you determine which risks are worth taking.” At first, it seems like Barry has good reason to feel that nothing can hurt him or the ones he loves. He has the speedforce on his side! But a tension simmers underneath, and tragedy feels like it could strike at any moment. Of course, Barry’s joyful attitude warrants some skepticism. No hero is invincible, no matter his powers. The Flash can’t be everywhere, as Wally reminds Joe. As if to emphasize that point, the most important plot developments are relegated to the final ten minutes, freeing up some time for “Invincible” to explore the season’s broader themes. The way this episode deals with the similarities between Barry and Zolomon and the nature of heroism highlights why The Flash stands out in the crowded market of superhero adaptations. A bit before the episode’s midpoint, Barry gets the bright idea to confront Zolomon, who is still holed up in the Central City Police Department. “I know you didn’t call me up here to banter,” Barry says. But he did! During their conversation, Zolomon explains that they are two sides of the same coin. Barry and Zolomon share plenty of traits: A tragic backstory and a desire to be the best, most notably. But Zolomon sees Barry’s heroism as a weakness. He also misunderstands the reason why he wants to be a hero. Barry doesn’t posture; this isn’t about being loved. It’s about helping people. The fact that Zolomon is an outright sociopath doesn’t make him unbeatable. It’s a liability. As we’ve learned over two seasons, The Flash isn’t beholden to its source material, but it doesn’t play fast and loose enough to undermine Barry’s core, either. It has the heart and zaniness I love about comic books, and it updates the aspects it considers malleable. Those choices aren’t always perfect; just look how long it took to integrate Iris with the team. Even now, she still isn’t given enough focus. That’s the show’s most glaring issue: It has always struggled to develop more than one female character at a time. I’m saying all of this to make a point about the best villain in the episode — no, not Zolomon. I’m talking about Earth-2 Laurel Lance (Katie Cassidy), a metahuman known as Black Siren. In a single episode, The Flash better serves Laurel than Arrow did in several seasons. Introducing a badass female villain adds a lot of energy to this show. Black Siren has swagger. She has great chemistry with Zolomon. (Did they ever date?) Her Canary Cry is powerful enough to topple buildings, which Zolomon orders her to do for reasons that aren’t really explained. She has a sharp sense of humor. (“Laurel Lance is dead. On this Earth, anyway. Poor Black Canary. Bye-bye birdy.”) Also, out of all the metahumans working with Zolomon, she comes the closest to killing Barry. Considering that she’s captured alive at the end of the episode, I hope she returns. Black Siren even plays a key role in one of the episode’s best scenes. We learn that Barry has found a way to stop everyone from Earth-2, which involves something that Cisco dubs “dimensional shock therapy.” If Barry sprints quickly enough around the city, the new device will be able to target the frequencies of everyone from Earth-2, essentially knocking them out. But when Black Siren targets a heavily populated building, the team has to adjust their plan on the fly. Cisco’s solution? He and Caitlin pretend to be their Earth-2 counterparts. This is why I love The Flash. Weird, funny, layered moments like Caitlin pretending to be Killer Frost and Cisco basically cosplaying as Reverb, right down to his mannerisms and speech patterns. It’s a stellar scene. “Why serve a master when you can be a master … when you can be a god? We could be gods,” Cisco says, echoing a speech the real Reverb gave him on Earth-2. Black Siren is interested in what Cisco and Caitlin have to say about overthrowing Zoom. Seeing Cisco and Caitlin pretend to be their Earth-2 counterparts just reminds me that I wish those characters weren’t dead. Killer Frost and Reverb added a lot to the show. It was a mistake to have Zolomon kill them off. The imitation act isn’t as solid as they think, though. Black Siren tosses some metal scrap to Cisco, confirming her suspicions when he catches it with his right hand. Apparently, Reverb was left-handed and all doppelgängers are mirror images of each other. (This doesn’t make sense when you think about it. There are more than two Earths, and there has been some weirdly contradictory information about how these various Earths work.) Cisco’s powers seem to have grown for a moment when he shoots vibrations from his hand to protect himself and Caitlin. But he can’t replicate the blast. Doesn’t matter. Barry’s plan works, knocking out all the Earth-2 metahumans who are then locked up between S.T.A.R. Labs and Iron Heights. The sole unintended consequence? Jesse’s headphones meant to block the effect don’t work, so Harry gives his to her, leaving him unconscious. Which sort of explains his absence at the end of the episode, I guess. What’s most important happens at the very end. Iris hosts a little surprise celebration for Henry since he has decided to stay in Central City. Since he’s made that decision, it’s been pretty obvious that he wouldn’t survive. The scene is so sweet, it turns ominous. Everyone laughs in Joe’s home. Barry and Iris decide to date each other. But the moment Cisco has another vibe giving context to the weird dead birds he kept seeing, it’s obvious just how ugly things are about to get. What does Cisco see? The future — and Earth-2 split in the half. The end of the world, basically. And that’s not even the worst of it. Given Zolomon’s belief that he and Barry are so similar, it was only a matter of time until he did something terribly drastic. If Barry can’t see their similarities, he’ll make him see. Zolomon speeds into Joe’s house, grasping a frightened Henry. Barry doesn’t even hesitate, speeding off after him. And there’s that look on Wally’s face. It’s pretty stellar.